Honda Motorcycle and Scooter India has launched its first entry-level motorcycle in India and thus made its debut in the entry-level bike segment. 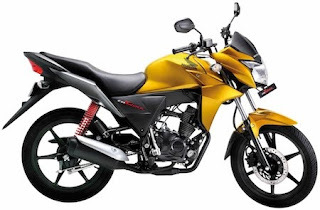 The new bike is christened Honda CB Twister that is priced at Rs 42,000 (ex-showroom, Delhi). The launch is followed by TVS Jive and Bajaj Pulsar 135. Honda launched three variants of the bike: Self Disc Alloy, Kick Drum Alloy and Self Drum Alloy. However, one can buy the bike after the commercial launch in February 2010. The sports looking bike will be available in five stunning hues i.e. Pearl Nightstar Black, Pearl Fuji Blue, Pearl Amber Yellow, Pearl Siena Red and Candy Sonic Green. As per the company, it will give a decent fuel economy of 70 kmpl. The higher end variant will have a 240mm disc brake. The bike is provided with maintenance free battery, floating side cowl, screenless layered front cowl, classy headlight, muscular fuel tank, multi reflector tail lamp, short silencer and tail light. The bike comes loaded with 110cc power mill that churns 9 bhp of maximum power. This affordable bike is an eco-friendly vehicle with BS-III norms complaint. Honda aims to sell 2.20 lakh units of the new bike by the end of year 2010. It is also going to showcase in Delhi Auto Expo.